BiuBiu, the star-keeper, wakes up one morning to find that all the islands in his world have sunk into the deep sea. The stars, whose energy is used to keep the islands from sinking, have been stolen from the tops of the lighthouses. BiuBiu must find and collect the stars and return them to their original places. 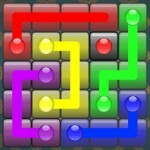 At the same time, BiuBiu must navigate deadly mazes and steering through intricate traps, so he can restore order to the world. 48 challenging and superior levels. Delicate art design and attentively made animations. Plenty of combinational uses of diverse triggers and traps. Unique player guidance presented as a set of animations. Playing through the game freely with one-time purchasing. Press the grids alongside to move one step. Drag a move line from BiuBiu to move automatically. The move line will turn grey if you drag to an inaccessible position. Press and hold on a magic stone or an iced mummy to push it forward. A wand is used to freeze a mummy or divert a laser guardian.